Purchase your signed print publication right now! Purchase from Amazon.com a copy of this book in print publication by CLICKING THIS LINK. Purchase from Amazon.com a copy of this book for your Kindle by CLICKING THIS LINK. Purchase from Barnes & Noble a copy of this book for your Nook by CLICKING THIS LINK. It seems that so many times when I have gathered with friends and family, inevitably the topic of conversation ends up being a storytelling session about all the whacky things that have happened over the course of my years of being in the business of innkeeping and hotel and motel management. The reactions I’ve gotten have ranged from shock to uncontrolled laughter. And so, here it is. I left the hospitality industry nearly a decade ago, and haven’t regretted it; it has taken that long since then to get this book together. Working on it in fits and starts I believe has been instrumental in crafting what I hope to be a masterpiece whereby, not unlike those hours of sitting around the kitchen table or open fire, I can cause people to pause in shock or laugh out loud, for that is my intent. Too often the nonsensical dreams of wannabe innkeepers clouds the realities of what may lie before them. I had no such chimera, since my fantasies had been more of the nightmare variety. (I’m not sure that I can say the same for my wife, as is displayed in the opening sentence. In my storytelling, my wife has often remarked to me that to her it appeared “all these weird things happen to you.” Without fail my response has been that these “weird” things happen to everyone. It’s just that most people don’t pay attention to what’s going on around them. I have paid attention, and I hope that I have been able to present those observations in an entertaining fashion, worthy of your time. I am not one to write in adult or cursing language, although there are, on rare occasions, some expletives to be found here; they became necessary only because I was quoting someone and felt it necessary to maintain the moment. 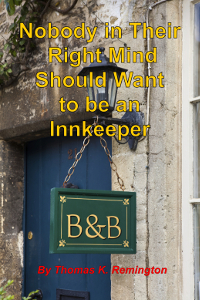 To all those people who have ever thought about, or seriously considered becoming an innkeeper, the authenticity of that lifestyle might be more than you had bargained for. This book is not a “how to” for getting started in the inn-keeping profession, but it does contain a lot of valuable information, based on my experiences, that could be useful to anyone in this business or who is interested in jumping into it. It helps to give those with such thoughts a better understanding what the commitment actually means. It’s not all roses, and it demands a special person. In the small Maine town, where this saga begins, was the site of an Abenaki Indian village and the area abounds in preserved evidence of their habitation by the names they gave to their surroundings. The Androscoggin River flows through town with its Indian name meaning ‘where the fish are cured’ (The Dictionary of Maine Place Names by Philip Rutherford). The Indians named the mountain range to the north – Mahoosuc: ‘Home of Wild animals’ (Mountains of Maine by Steve Pinkham). With Mahoosuc I think they had a premonition of the rusticators from the south who would come north to ski, canoe or just explore the edge of the northern forest a few centuries later. The early name for this town was ‘Sudbury Canada’ but it changed to a name meaing ‘House of our Lord’ as early settlers viewed the magnificent landscape of the area. Joshua Gross Rich (A recent book Joshua Gross Rich by William B. Krohn provides a useful early record) frequented the area a century and a half ago recording various tales of exploration, geology and feats of daring-do. The Maine Humorist Joseph Perham has spent most of his life a few miles south and has told many humorous stories about growing up in the area and about the fellers that would gather around the wood stove or in the local Trap Corner Store to swap tales of local happenings and to provide first-hand accounts of some pretty hair-raising events. Tom is a descendent of these backwoods fellers with local knowledge and a first class understanding of the human condition. The area has lots of history and the cultural-economic environment that Tom grew up in came with the white settlers a couple centuries ago. Things have changed rapidly and not necessarily for the better. The latter part of the 20th century and the beginning of the 21st century have seen traditional rural Maine culture being replaced (at least attacked) by the folkways of the people from away and many of them have adopted the motto: ‘If it feels good – just do it’. A few years ago I read the comments of a bush pilot recorded as he took a paid customer over the length of the Androscoggin River from near the City of Lewiston, up through Bethel, to Umbagog Lake – the headwaters of the river. He commented that the river was cleansed of jobs at the same rate as the water became free from industrial, agricultural and wood-harvesting pollution. Well, he was right. It has been increasingly difficult to make a living in rural Maine, outside government work, and many of the folks that stayed-on have gravitated to some job related to tourism. That includes Tom and Melinda Remington. 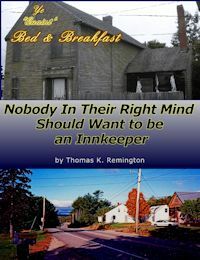 Well, this book by Tom Remington, who is noted for his excellent research and well-written essays on wayward environmentalism, wildlife mismanagement and maligned science on his two Websites ’The Black Bear Blog’ and ‘Tom Remington’, tells about his family’s experience in making-do in this changed and changing environment. Tom’s book is a real page turner, filled with humor, philosophy and introspection. You will enjoy his tales of living in a haunted house, a sauna blowing up, a doctor from away sneaking people into motel rooms to avoid paying for them and so many incredible experiences ….. one can only imagine. The making-do started with buying and then rehabilitating an old house in that little town to house a newfangled idea of backwoods subsistence: A bed and breakfast. Tom and the new kind of rusticator from southern Maine and locations further south and west culturally clashed and sometimes even more than that. For a man that was raised in the foothills of the White Mountains, like me, it is often too much of a meeting of dissimilar peoples to continually deal with these folks from away. I can relate to some of Tom’s tales because my family owned a large restaurant some thirty miles south of town. To feed these folks at a restaurant stretched patience but to have to live in the same building with this rotating horde of flatlanders as in a bed and breakfast would require more tolerance than I could ever muster. The book spans a decade in which Tom and Melinda move through several types of hostelry management from bed and breakfast, to motel, then mountainside resort followed by a seaside motel and finally a big move to – of all places – Florida as staff in a large Hotel. For Tom, this career on hostelry rubbed him raw in many ways but put food on his table and money in his pocket. Melinda is more accommodating and likely can see more usefulness in her clients than can Tom. Yeah, they are still happily married. As I said, Melinda is exceptionally capable of being understanding. Back to the little village: This advance of multi-cultural civilization adequately described elsewhere as ‘Slouching to Gomorrah’ doesn’t extend far north of town. Folks coming to the area in their finery – with even finer automobiles – are met by the Black Fly in summer and the deep snows, cold and desolate landscape north of town. The east-west highway that passes through the town and one further north through Rangeley are called ‘the Volvo Line’. Locals can drive, hunt, work or just plain meander with very much diminished chances of seeing many of these out-of-staters pass by in their Volvo’s. They stay far to the south. And for that we are always grateful. Quite a story Tom tells about his experience in hostelry and I doubt it will motivate many folks to follow in his footsteps. This is Tom’s second book with the first being ‘The Legend of Grey Ghost and other Tales of the Maine Woods’ a story of deer hunting and campfire tales from the Western Maine Mountains that he wrote with his son Steve. Many of the descriptions in the book were familiar to me because as a young man I hunted the area just over Patch Mountain from Tom’s camp or the nearby Speck Ponds. I came to know Tom by reading his daily outdoors content on his Blog and through exchanging information that we both find interesting and many times useful. Tom and Melinda spend summers in Maine at their cabin. Winters they are in Florida where she teaches school and Tom runs his network of outdoor blogs.